No matter how careful you are as an owner – or how meticulous your car maintenance is – you always need to ensure you have adequate protection should the worst happen and your classic lets you down. Even the most looked-after classic can have the occasional blip in its reliability record; so whilst many hands-on owners are able to fix basic faults at the roadside, it’s important that there’s extra back-up available when you need it. And that means making sure you have breakdown cover that suits your particular needs. You may find that your classic car insurance policy includes some kind of breakdown assistance, and this can often be a cost-effective way of gaining peace of mind. But it’s important that you check the small print, particularly when your policy us due for renewal. Does it, for example, still provide a recovery facility or does it offer just roadside help? And assuming it does include recovery, is there unlimited mileage allowed for this, or will your car simply be dispatched to the nearest garage? 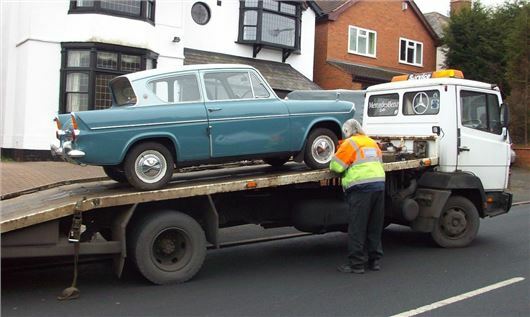 Keeping your breakdown cover separate from your insurance can work better for many people, particularly those running a combination of modern and classic vehicles. Rather than having each car covered on separate breakdown policies, they often prefer to take out personal cover that applies when they’re driving any vehicle – even one not owned by them. Add on a small extra fee (sometimes around the £20 mark) to include their spouse or partner and they’ve got a policy that covers most potential breakdown situations. Whether you go for breakdown protection that covers you or simply your one car, it’s vital that the policy suits your needs. Some of the more basic policies, for example, won’t offer you roadside assistance if you’re within a quarter of a mile of home, so check you’re covered for home-based breakdowns if that’s what you need. And, of course, you should again look for any limitations when it comes to recovery, as there can be limits as to how far your car will be transported. It’s also worth enquiring about help with onward travel, which usually offers a hotel room and car hire if your vehicle can’t be repaired, with your car transported to a garage of your choice as part of the deal. If you tend to use your classic for holidays or long excursions, onward travel cover is well worth considering; and if you’re one of the increasing number of classic car owners now venturing abroad with their vehicles, it’s important to ensure your breakdown policy includes comprehensive European cover. Finally, don’t forget to shop around every time your breakdown cover is due for renewal, as many companies offer more favourable rates to new customers than for existing clients. It’s annoying but it’s true; and so changing your provider each year (or asking your existing provider to ‘price match’ other quotes) could save you a significant sum in the long term.